Read the sentences below one at a time to your child. Ask them to write it on paper. This will help you to check if they can write a dictated sentence (another Year 1 statement in the curriculum) and which common exception words they can spell. The children need to be able to do this again independently (on their own). Then check it, any words they have not spelled correctly are the words they need to focus on. You can make up your own sentences for your child to write on different days. The more they write the more their writing improves. Write the sentences correctly on paper. Contracted words: Do you know them all? Can you use them whilst writing? Children will be tested on these spelling on Friday 15th March. Please make sure you go over the other weekly spellings daily. Try this at home. Choose a 'theme' and think of as many words as you can. Write your first word and the last letter of that word then becomes the first letter of the next word going down. Please read the story to your child. Then they need to re-write it in their own words. Using capital letters, finger spaces, full stops. If they can use adjectives and the conjunction 'and' that will be great! 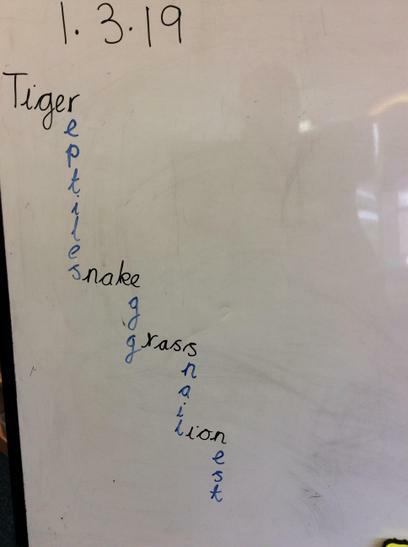 The children were given 10 spellings on Friday. Please can you ensure your child learns them. Choose one or two a day to learn. The spellings test will now take place the week after half term, plenty of time. Thank you.